Something terrible is happening to Amazon.com right now: it is not working! I don’t know about you but I personally find this frightening. In our era of online services, I don’t expect website like Google, Apple and Amazon to stop working. 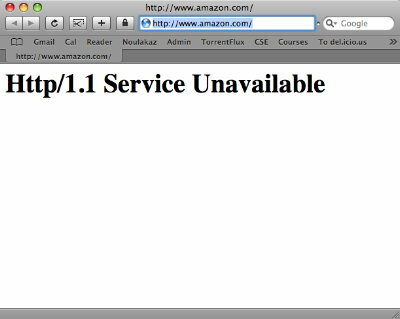 Given that Amazon.com is not a single server but rather a massive cluster, the problem must be really serious. I can imagine hundreds of Amazon engineers maddeningly working on restoring the website to its pristine condition. For some extremely obscure reason, https://www.amazon.com/ is working. Actually, the secure site appears to be down, as well. I’m finally getting further than the initial error text, but not by much. Aside from basic security concerns (who’s reading my credit card numbers now? ), I find myself wondering how much income this is sapping away from the company. I’ve read somewhere that they normally earn around $500 per second meaning that they are losing tons of money right now! Interestingly, it seems that AWS is working well. Hi Mr meetoo! I would like to ask you if it is really safe to pay online by credit card!? i am totally new to that and have read that paying online using credit cards is not so safe! I would like know which is the safest way, i mean base on your experience!! Thanks! btw nice layout and you have got a lot of interesting posts! amazon through HitWiser.com , to test the predictive text! (Sorry Avinash, its working on i.e only at the moment). The error message first made me think that there was something wrong with Hitwiser.com ! haha! I was relieved to see that typing amazon.com on the address bar gave the same error. More worrying is that it’s not the first time this year! Got it mr avinash! Thank you! I’m new to Amazon.com and trying to figure out how it works. What’s wrong? Someone please help.